Super Cheap Fresh Font Combos for Your Design or Blog business! You already know how much I love AppSumo, so I was thrilled to see this sale going on for the next 2 days only! Right now, you can get $25 worth of fresh font combinations from bonfx for just $11! 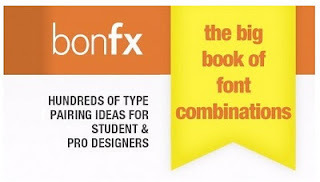 "It’s for those looking to find inspiration and save valuable time in the process, and to avoid burning a hole into your eyes (and sanity) from staring at the screen for 4 hours looking at typefaces. This book is NOT a showcase of typography. It’s a tool. A workbook. A sketchpad. It’s your favorite layout application document captured 350 times in the process of trying different typefaces on for size." Sound nifty? Snag it before it's gone!